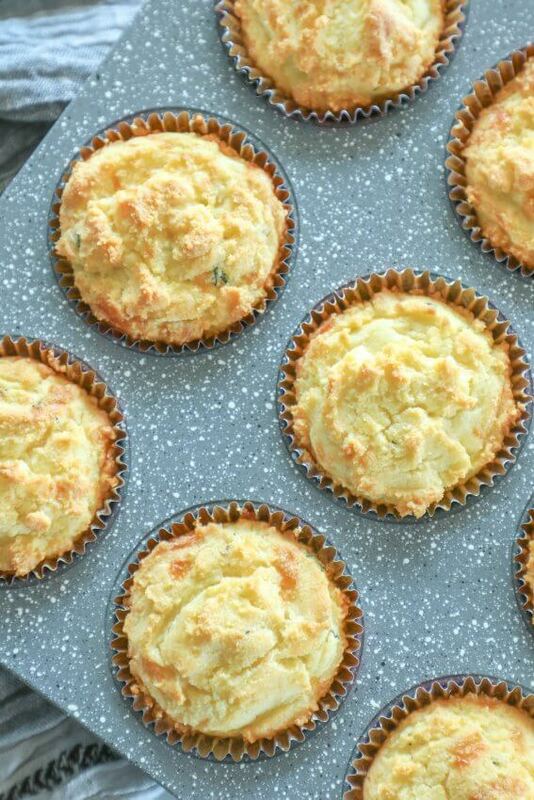 These tasty Keto Cheesy Herb Muffins are fluffy and tender and loaded with flavor! The perfect low carb side to soups, chilis, and even your favorite Keto breakfast of bacon and eggs! 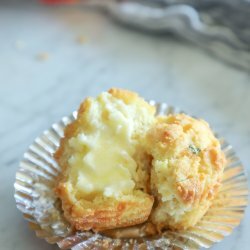 On tasting them, Mr. Hungry immediately pronounced these keto cheesy herb muffins the “best low carb bread thingy you’ve ever made!” I have to agree with him, these savory low carb muffins really did turn out amazing! I’ve got some great keto soup recipes coming up and I wanted to make something that would round them out and make a complete meal, which is how this savory keto muffin concept came about. We were leaving Honduras for a trip to the US the following day so I was using up ingredients I already had in the fridge – thus the cheddar and thyme combination that I’m posting here. I love how these flavors worked together, but the beauty of this savory keto muffin recipe is that you can absolutely change it up and use other cheese/herb combos based on what you have on hand – or your own flavor preferences. 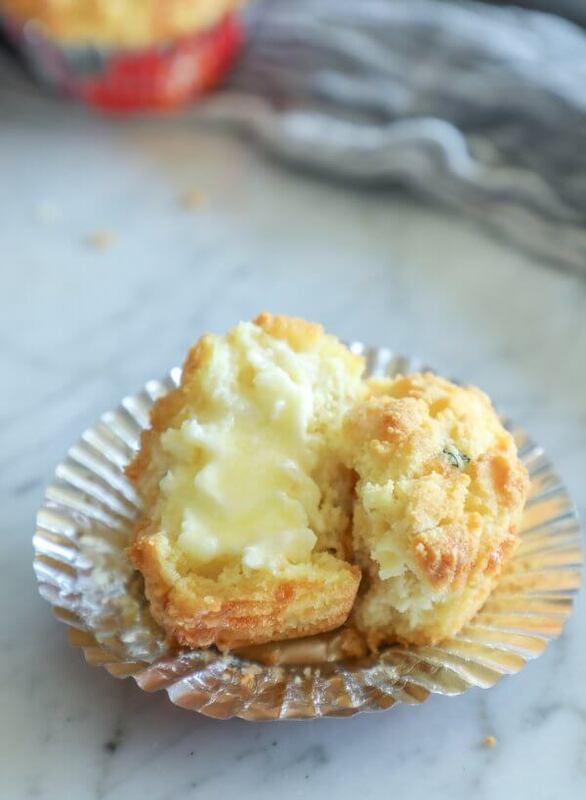 What I love about these keto cheesy herb muffins is that the top crisps up and is reminiscent of the popular cheddar herb biscuits from Red Lobster, while the inside has a perfect crumb and soft texture of a muffin. Slather them with butter and I promise that these delicious low carb muffins will be your new keto BFF. I have ideas to make a double batch of these savory keto muffins in a sheet pan and then cut them into cubes for stuffing. Or crumble them and toast them further to sprinkle over my keto Chorizo and Green Chili Mac and Cheese or Green Chicken Enchilada Cauliflower Casserole for an extra layer of crunch and flavor. 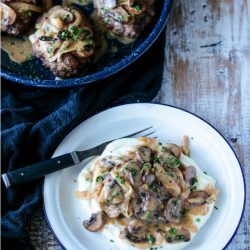 OR use them as the base for a new low carb stuffed mushroom recipe! 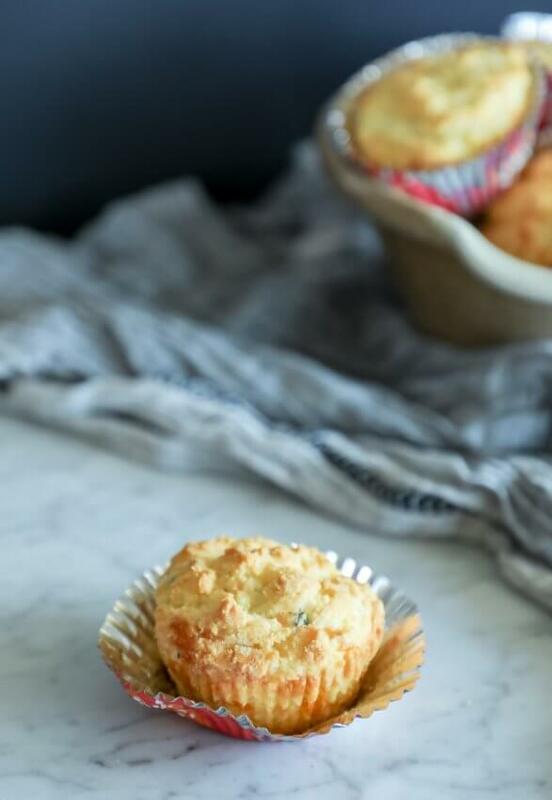 The list goes on – this keto cheesy herb muffin recipe is so versatile that there is no end to the applications for it in your keto recipe repertoire! For starters, I recommend that you make a batch of these as is right away – then tell us what creative things YOU would do with them in the comments! These Keto Cheesy Herb Muffins make the perfect low carb side to soups, chilis, and even your favorite Keto breakfast of bacon and eggs! Gluten free! Grease or line a standard cupcake pan with 8 muffin cups. Place the butter in a medium-sized microwave safe bowl. Microwave on high, uncovered, for 30 seconds or until melted. Add the sweetener, almond flour, coconut flour, salt, garlic powder, baking powder, xanthan gum, eggs, fresh thyme, almond milk and cheddar and mix well with a fork. Spoon the batter into the muffin cups, about 2/3 full. 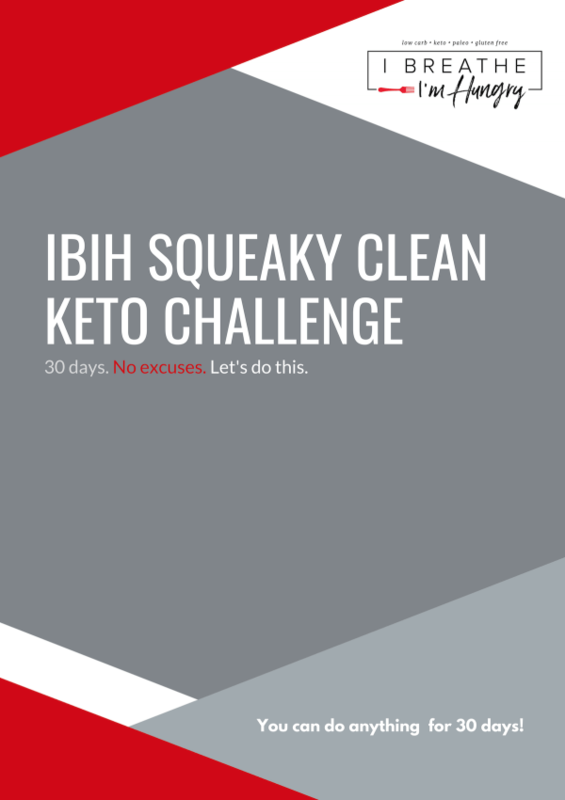 For recommendations on the brands I use and prefer for best results when baking keto friendly recipes, see the IBIH Pantry Recommendations Page! Did anyone else find the coconut flour taste a bit too strong? I followed the recipe exactly and will sub out the coconut next time, just using more almond flour. Oh, one thing I changed… I used Milkadamia milk instead of almond milk. It’s expensive, but a container lasts a long time in the fridge and it’s really yummy. I, too, found the salt to be too much, but all in all these really hit the spot. I made a double batch and ‘dried out’ the second batch (on purpose) and made a savoury bread pudding with bacon and topped with green onions once done. Divine! I made these yesterday and they turned out delicious. 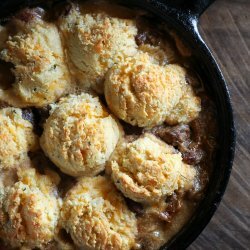 I was wondering if there is any way I could make them into a regular biscuit, instead of savory. I just tried and I read a post where the lady wanted to use milk and you suggested 1/4 HWC and 3/4 cup water. Was that in place of the cheese? So, I did that and it was very runny. I added a couple more tbsp of coconut flour. I left out the cheese and herbs. I’m going to bake them now and see what happens. Sure hope they turn out. The cheese acts as a binder so hopefully they stayed together for you ok without it! Oh, dear, they are very crumbly. I guess I should have added the cheese, but I also found that much liquid made the batter very runny. Next time I’ll use the almond milk. Taste good, though. Else and this feels like heaven. Good job! I just made these oh yummo! Been on Keto 2 months (lost 25 #bs ) so far and starting to really experiment now with different recipes. These are the best muffins I’ve tried so far. Next batch I will use Monterrey cheese and chopped green chiles w/cumin or chopped cilantro. This will be my go to base for a variety of flavors.. Thankyou! also I used silicone muffin pan reg size (6) and also a silicone muffin pan with the very small muffins (24) sprayed with Pam, let cool and they popped right out . Had some batter left over in the small muffin batch so just put it in Saran wrap in fridge and will bake tomorrow. I am so glad these freeze well. I just made these to go with a low carb tomato soup recipe I found, they were perfect! Not exactly a replacement for the grilled cheese we all know and love, but dipping pieces of the muffins into the soup was a pretty good second! Thanks for sharing I’ll make these again! 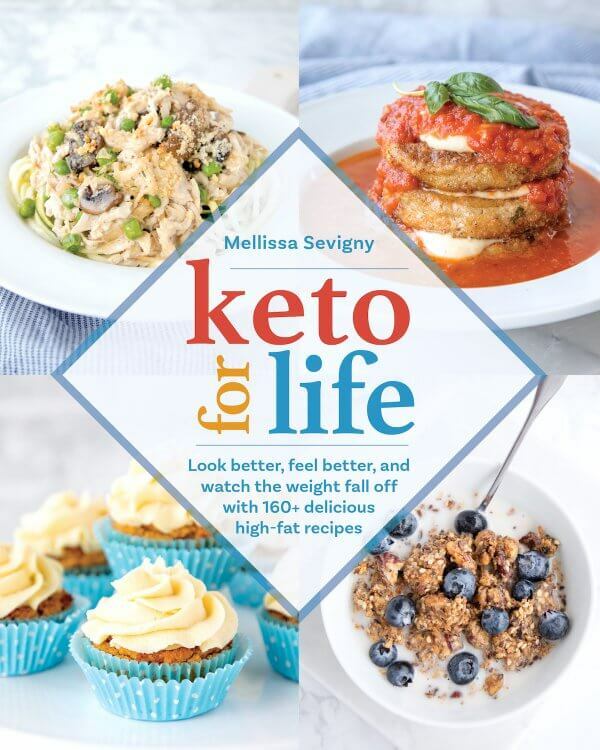 Thank you Melissa for the recipes and the education. I am lowering my carb intake as part of a healthier diet, just beat stage 4 cancer and am making more “intelligent” food choices. I am not trying to lose weight, but I feel better when I cut the carbs. Getting adequate veggies has been a challenge and so many of your recipes are smart and healthy. 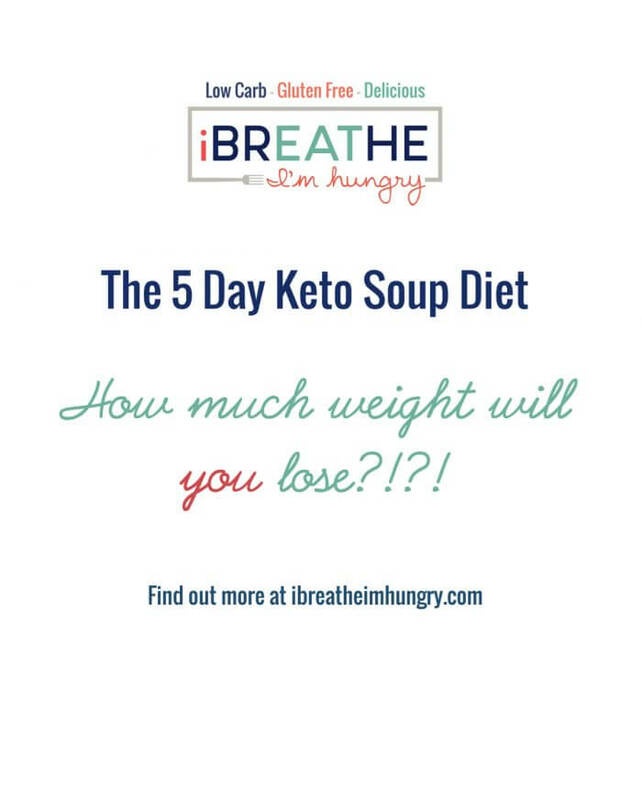 Love the Keto soup and I add low carb foods to keep it interesting and varied. It is my work lunch go to and I can make a pot and have it all week! I do miss a piece of bread with soup and the muffins are awesome. I also want to thank you for being conscientious and kind to followers who ask off the wall questions, like the fork one. (have a fork scraping the bowl issue too, but we are taught not to change the directions when baking, every step is in that order for a reason) Glad to know I can happily grab my spatula and mix away. These days, many would have tried to make fun of that question. Back in the day we would say you showed elegance and grace and me, well I still say it. That and yummy recipes too! Girl, you are the whole package. Please keep the yummies coming, we appreciate you. Oh my, were these ever tasty! A win for my young daughters too. Tonight I made them with your creamy basil tomato soup, also wonderful! It tasted like such comfort food on this chilly night. 1 muffin and 1 cup of soup and I felt very satisfied. I can’t wait to experiment with other herbs. I am thinking rosemary with a little lemon zest!!! Plus, I just saw the monkey bread muffins…. next weekends game plan! Thanks for taking the time to share your recipes. Very grateful! Love them and so easy to make. The Thyme makes them so tasty although I added more. Going to experiment with different spices. Thank you for a really tasty savoury muffin. Loved these little muffins! Slightly too salty for my taste so next time I won’t add salt. I also suggest adding more thyme, but that’s just because I love the flavor of it. Thanks so much for the recipe! Extremely good but not too structurally sound. Very crumbly. Hi! Question- Is sweeter needed for these? I need a good muffin to eat with things but I’m not into sweet muffins. If I omit that, do I need to change anything? Have you had it without it? Lastly, what other flour can I use besides coconut flour? Add more almond or a different one all together? Unfortunately, coconut doesn’t agree with me. Thanks! Looks really good! I cannot say enough about these muffins!! They are so good! Especially when paired with the delicious Tomato Basil soup :-) This is a great combo for lunch or dinner and gives you the feeling that you are enjoying comfort food without all of the carbs. Great find! Awesome, but next time I will omit the sweetener. I prefer my cheese herb muffins to be more savory than sweet. Just a preference, but otherwise, fantastic! Thank you! Made them last night, I only had ground Thyme, so is think that made them a bit stronger with the herb flavor, but that was on me. Followed the recipe and they came out great and my husband was very happy, this is the first muffin or bread recipe that has worked out for me so far. Looking forward to getting the proper ingredients and trying again, thank you! These are perfect and delicious. I make and freeze blueberry muffins for an on-the-go snack and sometimes I want something savoury. These hit the spot! Hi! Would that work without xantan gum? These are great when you just want a little bit of the garlic bread feel with your meal…love these easy to make muffins. Sooooo delicious! Perfect with a warm bowl of soup! Excellent texture and flavor. I used regular muffin liners and they stuck while warm but not after they cooled. I used unsweetened cashew milk and Lakanto Monkfruit granulated sweetener, though I think the sweetener could be halved or perhaps omitted. The texture stayed good after freezing and thawing. These are miles ahead of all the other keto drop type or muffin type ones I have made. Thank you Mellissa. Thanks Shirley! I picked up some of the Lakanto Monkfruit sweetener when I was in the states but haven’t tried it yet – it may be sweeter than what I used because my muffins weren’t sweet at all. Glad you enjoyed the recipe!!! So far everything I’ve made has been great. Melissa, I have been dairy free for 2months- do you happen to know of a substitute for the cheddar cheese? or Is it possible to make these without cheese? almond cheese? OR omit it but it may affect the flavor and texture. I FINALLY made this recipe tonight, it was SUPER easy and I actually got 9 muffins out of it which is great for us( family of 3). I used every ingredient exactly and followed your directions to the t. I was surprised because my son and I usually cannot stand erythritol, it makes our tummies hurt, but it was such a small amount and I have a lot of Swerve left over, I figured what could it hurt, and we are happy to say no stomach discomfort or “buzzing” feeling our mouths. Swerve causeed me major gastric distress. Lakanto seems a lot better. I am so happy for your recipes! 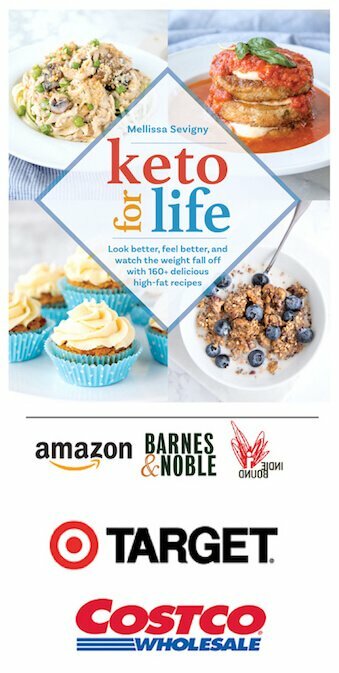 I have been doing Keto for about a month and a half now and am ready to really start baking some low carb meals. 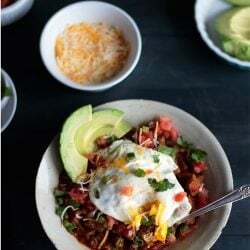 I’ve love your spaghetti squash chili recipe as well. But these muffins!!! So good!!! Thank you ! The last batch, I switched out the savory ingredients and used a little extra stevia, melted dark chocolate, cocoa powder and cinnamon. I know I added to the carb count somewhat, but the result was wonderful. I just started keto and these were delicious. I made them with a keto jambalaya and they were great. Thanks so much for the recipe, I can’t wait to try more of yours. Also, the ads aren’t a big deal. Simply delicious. I use the recipe without any changes. These were very good in taste and texture . I half the recipe because I hate to waste ingredients. I have tried so many Keto bread recipes with good reviews and for me the end results were not good. Next time I will make a full batch. I now have a recipe that actually taste like bread. The muffins did stick to my liners. I will try to use parchment liners or oiling the liners as was suggested in the comments. Thank you for sharing this recipe. I look forward to trying other recipes on your blog. Thanks so much Pamela! I know there are lots of muffin and bread recipes out there so it means a lot to me that this one gets such high praise from you! I appreciate you taking the time to let me know you enjoyed it! I normally don’t write reviews but this one definitely deserves one. These are amazing!!!! You’d have no idea they were low carb. I doubled the cheese and didn’t have fresh thyme so I used ground and used 1/8 tsp and OMG!! That’s all I can say!!! Thank you for these!! Oh also my recipe made 12 muffins. This recipe put all the others I have tried to shame. Thanks so much Barbara – that really means a lot to me! And dried shallots sound amazing, I’m going to order some! These are really fantastic. My husband says they remind him of corn muffins! Mine did not come out of the liners as nice as yours. Maybe I will try oiling the papers first or using a non-stick muffin tin. Thanks for sharing! Next time try the parchment paper liners, I use them all the time and for me they work great..Can get them on Amazon and now and then I can find them in stores but not often..
Made these today and they are amazing! My husband loved it and even my 14 year old picky eater did too! Thanks! Melissa, I just found your website and I have to say I love your writing style. It’s so fun!. Your recipes look great and I will definitely try them out. However the sheer volume of ads on your website is really a turn off. I know you have to make money, and by now everyone is used to seeing ads on websites such as this but in my opinion there are simply too many. Just my opinion of course, but I did want to put it out there. Weird about the ads. I just revised my Facebook profile and now see very few if any ads. Thanks for these ~ but can I just place in a square pan or is it necessary to use muffin pan. 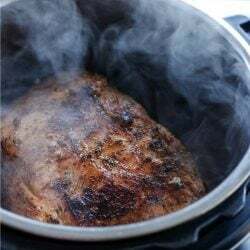 You can do it in one pan but it will take longer to bake through – you’ll know it’s done when a toothpick inserted into the center comes out clean. Really good, excellent texture. Left out the thyme and added extra cheese to the tops before baking. Great sub for red lobster biscuits. Could I use regular milk? Or HWC? Regular milk will increase the carb count quite a bit and HWC will make them too heavy. Try a mix of 1/4 HWC to 3/4 water and that should work well. Just confirming; a total liquid of one cup? The original recipe is 1/3 cup of almond milk. Thanks. These sound amazing! No, 1 part HWC to 3 parts water to make up the total amount called for anytime you’re subbing HWC for almond milk. So in this case it would be about 1.5 tablespoons of HWC to 4.5 tablespoons of water to make up 1/3 cup. 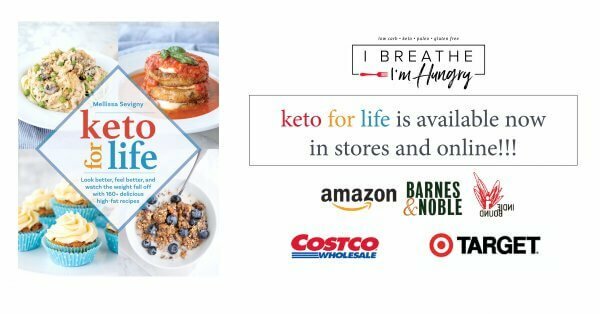 I’m three months in on keto and so glad to find this!! How necessary is the xanthum gum? 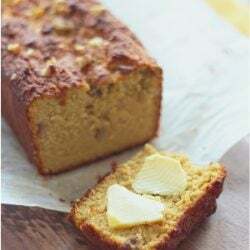 The xanthan gum will give it a texture similar to a traditional wheat based muffin – you can omit it but it will yield a more crumbly end result. What is xanthan gum for? Agreed Sandra! It’s hard to eat just one, especially when they are still warm out of the oven!!! These were great! Thanks! 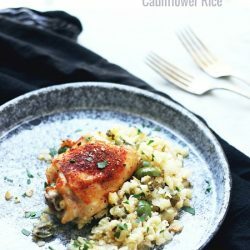 The entire family loved them at dinner tonight and I am bookmarking this recipe to make again. These cheddar biscuits are out of this world good. Made them first on Friday to go with soup. Made 2 more batches on Saturday to serve with Sunday lunch for the family. Most are “wheat eaters”. (Sounds like I’m calling them a bad name!) They will never know the difference. I agree with Mr. Hungry-these are some of the best thingys you’ve come up with! These look fab! Is the erythritol crucial? I don’t use sweeteners at all. Thanks! For these you can definitely leave the sweetener out and it won’t make a huge difference in flavor! Before my Low Carb lifestyle, I had a great Tamale Pie recipe. 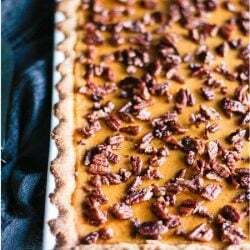 I may try to resurrect that recipe with this on top instead of cornbread. 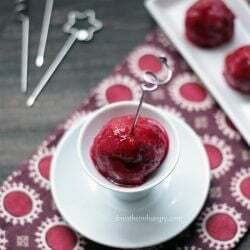 Sorry if this is a stupid question, but is it necessary to mix the batter with a fork, or can I use my favorite silicone spoonula? For some crazy reason I hate the sound a fork makes when scraping a glass bowl, but if it’s important to mix with a fork to aerate the batter, I would tolerate it! The fork isn’t necessary Cici, you can definitely use a silicon spatula or spoon instead! Thanks for this Mellissa. I am always looking for new butter delivery foods. Love that you can change the flavor by adding different herbs etc. Hope you love them as much as we did Katie!